Update: This session is currently on hiatus, but we’ll keep you posted! Working hard? Partying hard? 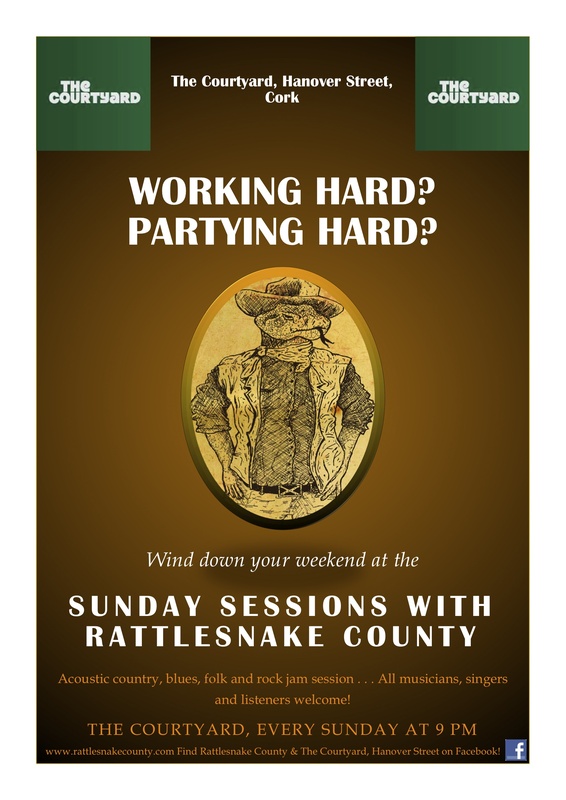 Wind down after your weekend at The Courtyard, Hanover Street with Rattlesnake County and the Sunday Sessions. We especially want to welcome bar staff, hospitality staff, nurses, doctors, guards and all the other folk who are working hard while everyone else is out having fun. If Sunday’s your night off and you want to kick back and relax after working for the weekend, this one’s for you. Rattlesnake County’s live music session will provide the acoustic choons to hum along to, or join in with if you’re feeling brave! Live old-school rock and country jam session (all musicians and singers welcome to join in! ), 3.50e pint specials, a cosy warm bar and a chilled-out atmosphere – what better way to end your weekend? Session on 9th March at 9 pm, next session on 17th March (specially on Monday for St. Patrick’s Day), 6-8 pm. Keep up to date on our Facebook page and check out our Youtube channel for a taste of what’s in store!